Arnaldo from Brescia (Brescia 1090 – Roma 1155) As canon goes to Paris to follow the teachings of Peter Abelardo, a theologian at the border with heresy because he followed a rational reading of the Bible before giving reason to faith. Arnaldo was of ideas similar to those paternity, firmly convinced that there is a need for separation between State and Church, contrary to the Pope’s and bishop’s temporal power, to possessing material possessions and the need for the Church to return to its origins. Arnaldo reveals however a man of action more than a theoretician, who returned to Brescia in 1119, is part of a canon movement against the bishop of Brescia Manfredo, accused of having riches and interest in politics; In 1139 his ideas and those of Abelardo were considered heretical by the Lateran Council II and Pope Innocent II made him expel from the city with a ban on preaching. Back in France, where he participated in the council of Sens in 1140 and, alongside Abelardo, clashed with Bernardo di Chiaravalle, the founder of the Cistercians; Is then condemned with his teacher forever in a monastery but he instead goes to Paris and continues to preach. Bernard then addresses King Louis VII and succeeds in obtaining his expulsion from France; Arnaldo first went to Zurich and later to Bohemia in 1143, where he was welcomed by Guido di Castello, the future Pope Celestino II, in the same year the revolt of Rome took place with the Pope’s expulsion and the establishment of the Free City. Later Arnaldo from Brescia obtained forgiveness from Pope Eugene III to Viterbo and in 1145, during a pilgrimage, returned to Rome; Here he devoted himself to a plan of radical reform of the Church that is linked to the ideas of the Milanese patriotic movement; Its basic points are: the renunciation of the Church to wealth, the return to evangelical poverty, the abandonment of temporal power, the preaching of lay people, the confession practiced among the faithful and the invalidity of the sacraments given by a clergy worthy. 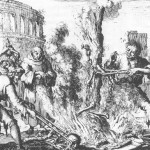 Because of his revolutionary and anti-papal comic, in which he asserts the priesthood of all Christians, he was excommunicated in 1148 but not persecuted because of the popularity he enjoys; Along with his followers comes also to address the Emperor Federico Barbarossa for Rome to establish secular power as opposed to the pope. In 1152 Pope Eugene III acknowledges the Commune of Rome as a political entity but in 1155 Pope Adriano IV, because of the killing of a cardinal, struck Rome with the promise to revoke it only after Arnaldo had been exiled; The people then stand up against him who is now heading north to Italy, but is captured and handed over by Federico Barbarossa to the cardinals as a sign of alliance. 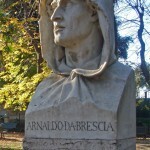 In the same year Arnaldo da Brescia was tried by the ecclesiastical court and condemned to hanging, then cremated and his ashes scattered in the Tiber.